I haven't placed a bag order in a while but knew I needed to when I saw these MAN BAGS! I'm always leaving the boys out with my cutesy bags so I definitely need these! Let me know if you'd like to pre-order a bag...black/grey; navy/green or camo! checkbox callling cards...great solution if you don't want to order them for each child! Last year we did this list and we might do it again this year but we are also going to do this: We've been doing Fountain Drink Friday for several years during the school year. A few weeks ago after discovering the QT milkshakes (they are super yummy) they decided we should have Milkshake Monday. I decided that might be a fun summer treat. That lead to Taco Bueno Tuesday. Then came WhataBurger Wednesday but we decided to change it to Whatever Wednesday so we can fill in the blank on Wednesdays. Might be eating out, might be a movie, might be sleepovers...we'll see. 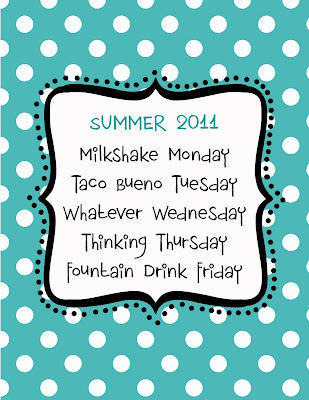 Thinking Thursday will be a trip to the library which leads us right back to the original: Fountain Drink Friday. Today I bribed them...Milkshake Monday was only happening if they cleaned their cubbies and rooms. They are cleaning right now. Don't forget to enter the giveaway on the PaperDoll Designs FB page!! Winner will be announced Monday night! It's been a busy few days for my sweet Nora Claire. She did GREAT and loved being on stage! Lots of last day of school parties...she loved her teacher this year and will miss her so much! Her birthday just so happened to fall on the last day of school...what a great present!! The bike was a pretty great present too. followed by a trip to get a FEATHER extension in her hair!! She was sooooo excited!!! Happy Birthday Nora Claire!!! I love you so much and am so lucky to be the mommy of such a sweet little fashionista like you!! !